There are more than 160,000 public water systems providing water to almost all Americans at some time in their lives. Millions of Americans receive high quality drinking water every day from their public water systems. But access to quality drinking water cannot be taken for granted. 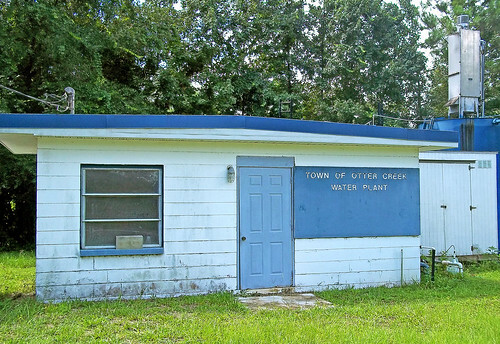 Like many small towns in rural America, the Town of Otter Creek in Levy County, Florida, strives to provide its residents with safe, high quality water. Unfortunately, for this community of under 150 people, poor quality drinking water is a reality. With high levels of trihalomethanes and iron in the water supply, town officials faced a potential health hazard and a lack of financial resources to address the problem. The Town was issued a Consent Order by the Florida Department of Environmental Protection to find a solution for the water quality issue. Given the town’s median household income of $18,000, and limited town resources, town officials sought assistance to develop a plan toward remedying the situation. The Town of Otter Creek’s water treatment plant. With funding support from USDA, the Town is working on a plan to improve water quality. The USDA Rural Development Special Evaluation Assistance for Rural Communities and Households (SEARCH) grant program, authorized in the 2008 Farm Bill to provide grants for predevelopment, planning design assistance and technical assistance to small, financially distressed communities, was the kick-start that Otter Creek so desperately needed. In fact, the $30,000 SEARCH Grant awarded by USDA to the Town was the first such grant awarded in the nation. The SEARCH grant, which will be leveraged with $10,000 from the Town of Otter Creek, will provide the necessary support for the Town to obtain a Preliminary Engineering Report and Environmental Report and to determine the most feasible path for the Town to pursue in solving its water quality problems to ensure that residents will soon receive safe, high quality drinking water. To find out how your community can benefit from USDA’s water and environmental programs click here.